World of RoboFarmCraft • View topic - Low battery warming? I remember receiving a warming to recharge my battery the first time it ran low. I'm not sure if I pressed a 'do not show this again' button or not at the time or if it was a one-time thing? Anyways, a warning might be a good thing when the battery is running low. At the very least, a visual feedback might be good, like the image of the battery (that you tap to get the precise percentage or change the robot's name) turning red at 10%, then pulsing at 5% or something like that). What happens if someone empties his/her battery? Game over? There is a kind of thing in the game called a "one-time event", but it's really an "every-time-it-happens" event with a "don't remind me again" button. So it's only potentially one-time. If you selected "don't tell me again", I can't very well keep telling you! I'll make a note to color-code the battery, too. "Soon!" Ideally, there is no "game over" scenario. I believe the current one is: you can sell your only saw, ignore the warning and sell it anyway. I'm thinking that wooden-saws might go to 0¢ buy/sell to prevent that scenario. If you think of another "Game Over" scenario, that's a serious bug; please let me know! NOTE: given the hint about the NOT gate and the OFF switch, you can probably devise a clever circuit that, if the battery falls below 25%, it kicks-on the generator a few times. That's actually kind of a fancy circuit. 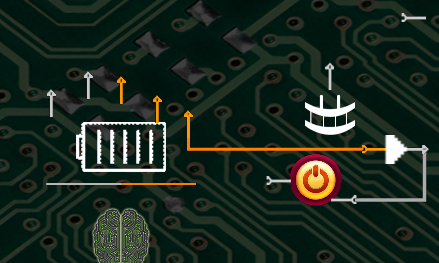 To do a nice job, it'd need a couple of item sensors, quite a few logic-gates, and you'd probably want to wrap the whole thing inside of an IC chip, just to keep it neat. Still, it's perfectly doable in the current game. ...And I'm adding stuff every week to make what-you-can-do be more! One reason I turned a warning dialog some time ago (I don't remember which one) was that it kept popping without letting me fix what it was warning me about. I should have noted that. So yes, the ability to tun a warning back on, at least for the battery, might be good. And all my gates are spent on making seeds at the moment. Soon I'll be able to make a circuit like that. I'm at NOT-gate seeds, working on OR-gate seeds. Yeah, sounds like I'm almost up to where you are. I've crafted a couple of gates, but I keep forgetting what-all I need to craft my @#$% plastic seed. worfc wrote: Yeah, sounds like I'm almost up to where you are. I've crafted a couple of gates, but I keep forgetting what-all I need to craft my @#$% plastic seed. Oh that would be good. It's a good thing you're playing, because I thought of something like that and I was sure you were going to say I was lazy for not making lists of lists or something. 8 silicon crystals, 6 iron ingots, 12 copper bar. 8 silicon crystals (19 bobs of clay, 7 charcoal (21 woods)), 6 iron ingots, 12 copper bars. Denis wrote: Oh that would be good. It's a good thing you're playing, because I thought of something like that and I was sure you were going to say I was lazy for not making lists of lists or something. Oh man! I hope I haven't been teasing you too much and now you won't tell me all your brilliant ideas! If so, I apologize; it's just sort of my nature and my sense of humor. I *LOVE* hearing your ideas! NOTE: The BOM only tells you what you need to make 1 set of something; it doesn't account for you wanting to make 10 of them (or whatever number). You have to do your own multiplication. SHORTCUT: if something is in your short list, you can tap it and that becomes the selected item (as if you wanted to craft one of those). If you still have short items, you can tap that and repeat. The problem (?!) is that, after a few of those taps, I forget what I was trying to make in the first place. Yeah, that's the cool UI -- Short-list toggle to show your short-BOM -- right? I didn't know about the shortcut, that's handy! Yes that short-list toggle would be pretty cool. 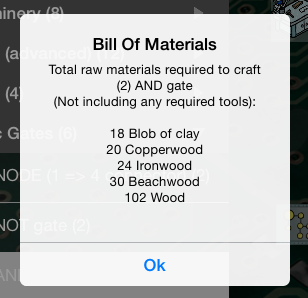 What your BOM for AND gates is showing is the required clay, not the clay you're missing to make those, right? Denis wrote: What your BOM for AND gates is showing is the required clay, not the clay you're missing to make those, right? Correct. BOM shows what you'd need to make it from scratch, and doesn't take into account what you might have on you, in chests, in other robots, laying on the ground, etc. "Your short" BOM will account for what's on your person. It'll be a BOM for the SHORT list.